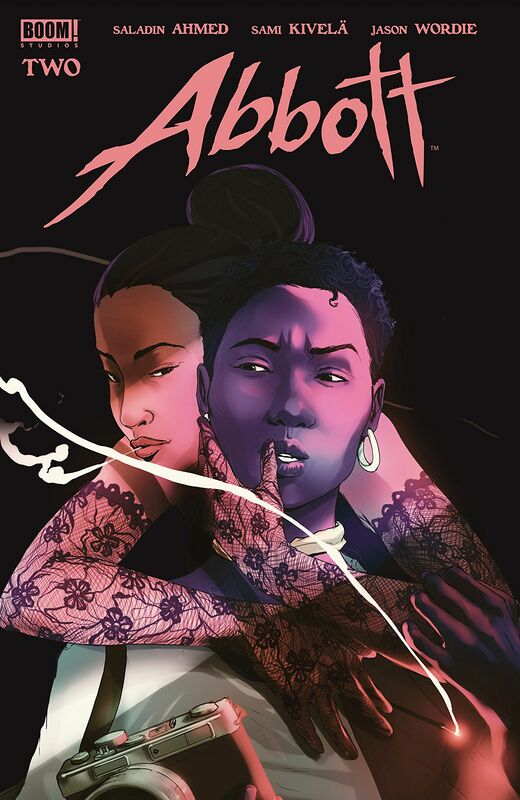 Abbott #2 Review – AiPT! The series continues to serve horror-noir intrigue. Abbott #2 from BOOM! Studios picks up immediately where the first issue left off in Elena Abbott’s story of crime and supernatural darkness. Does the second issue maintain momentum? Right out of the gate writer Saladin Ahmed amps up the supernatural terror plaguing Abbott as she investigates a grisly crime in 1972 Detroit. This issue reads like rich film noir, with Abbott delivering lines that approach the line of cliché when it comes to a hard boiled detective. Fortunately, Ahmed keeps her motivation to combat racial injustice in the forefront of her portrayal. That drive mixed with how personable she is with her friends and how cautious she is when a past love interest with a criminal background appears maintains a degree of nuance and depth in her character throughout the issue. Though it doesn’t feel like the plot has move a lot by the issue’s end, I’m comfortable letting the story build slowly at first as I get to know a character as complicated and interesting as Elena Abbott. I hope the past love interest I mentioned continues to make appearances throughout the series as well, because she completely stole the scene she appeared in. Abbott’s boss felt a lot more cliche with regards to his dialogue, but Ahmed does a good job of portraying him as realistic to the times, but not totally unlikable. I would say I’d want some more scenes to flesh out his character in the future, but based on what we’ve seen so far, I’m not super interested in his character. Ahmed has also done a good job at pacing out how much supernatural horror is shown so far. The scenes where stuff starts to get spooky are affecting because of how sparingly the horror is used, making the scenes leave more of an impact to the reader when things start to go off the walls. Those moments of supernatural mayhem and every other scene throughout are brought brilliantly to life by illustrator Sami Kivelä and colorist Jason Wordie. Kivelä’s lines and inks fit the tone of each moment perfectly, adding messier lines to supernatural effects that invoke chaos and the macabre while the more quotidian scenes are crisp and clean. Jason Wordie’s colors keep the mood exactly on target with every page, blending cool blues and purples in a dim bar setting and contrasting with warmer oranges in daytime scenes. Anytime something supernatural is going down, the colors mix in more pinks to contrast blues and purples, letting the inking stand out while expertly setting a macabre tone. The paneling of this issue is particularly strong and whether that’s due to the script of the illustrator’s choices, my compliments to the team for the creative choices they make to break of the pacing of each page and maintain the noir feeling throughout. Panels falling away as a character loses consciousness or moments of terror floating around character’s heads as they reflect makes none of the space on any page feel wasted and is pleasing to the eye to boot. Jim Campbell’s lettering is consistent throughout and I particularly like the work he does to show the newspaper clips of Abbott’s writing that help convey tone and setting within and without the particular crime Abbott is investigating. Overall Abbott #2 continues the strong start set by the first issue and is a series I continue to look forward to each month. It continues to blend horror and noir in a way that sets it apart from others in those genres thanks to its complex protagonist I can’t wait to keep getting to know. This issue doesn't slow down after the first issue's strong start with each team member bringing their best. Elena Abbott is a nuanced, complicated protagonist that I love getting to know. The artwork throughout the issue expertly conveys the tone each moment reaches for. The paneling is especially inventive in maintaining the issue's pace. Though the plot hasn't progressed much, giving the cast time to shine is a smart move in making me care about the characters. Some readers may not enjoy the slow pace and want the plot to pick up speed. Abbott's boss's dialogue feels cliché enough to make him less interesting.